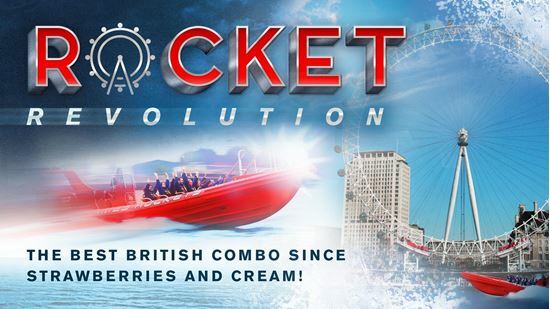 Our Thames Rockets are ready to propel you into years of history headfirst! There’ll be no trouble finding us at our world famous central London location and preparing for the Rocket ride of a lifetime. Be impressed with each other’s knowledge from Big Ben to the Tower of London before launching towards Canary Wharf at a thrilling 30 knots (35mph!). We’ll return you safe and sound (with your very own Rocket hairdo!) to the London Eye ready for the next instalment. Two of the best attractions in London all wrapped up in one classy spin. Please note: When making your booking you will choose the time for your speedboat experience. Once the booking is confirmed you will then receive a voucher for the London Eye to be redeemed on the day of your visit. One of the best ways to see London, first from the river and then from the sky! The speedboat ride is so much is fun too. "Speedboat trip on the Thames"
Great way to see the sights on the River Thames at high speed! You may not spend a better hour or so in London and you can go on the London Eye afterwards as you get on the boat at the London Eye Pier. Awesome! "Fabulous for kids and adults!" We loved it! The boat goes FAST and it was wonderful to see London by water. This was a great late afternoon activity to keep us awake after our overnight flight from the States. Followed it with the London Eye- and we got to see the difference in the views of London.